Great organizations’ sales and marketing teams converge to create a strategy, an approach, a culture called smarketing. The ones who do not do it so well are, well, are smelling. And your Modern-Marketer customers don’t like smelling, This convergence is a natural evolution led by a better-informed and more-empowered customer. Johann Wrede, a customer engagement specialist for SAP states, “Customers have less tolerance than ever for content-free interactions, and sellers are struggling to connect early enough in the buying journey to exert influence on the decision. To adapt, marketers and sellers need to assess and remix their skills, regardless of the organizational silo they happen to be in, rather than wait for organizational boundaries to change.” So, the customer and content is king. Are you a smarketer or a smeller? While there is no specific scorecard to discern the smarketers from the smellers, there is solid research to support the integration of sales and marketing strategy, content and activation makes sense. Smarketing Drives Growth. Aberdeen research indicates companies who ‘get’ sales and marketing integration grow 20% faster than those who don’t. Smart marketers, right? No, smarketers! Content Smarketing Generates Leads. HubSpot research suggests blogging companies generate 55% more leads than non-blogging companies. 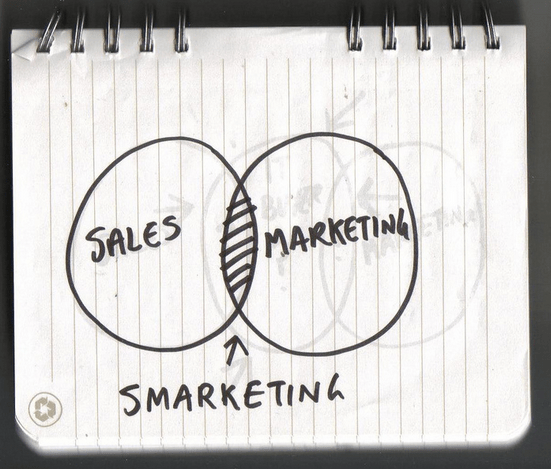 Smarketing Gets Sales Reps Involved With The Buying Cycle Earlier. SiriusDecicions findings show 70% of the buying journey is completed before the buyer is recognized as a prospect and in the CRM ‘books’ by the selling organization.The key inference is that there is less chance to frame the sales opportunities and more chance to complete an RFP. 2. Manage The Sales and Marketing Convergence. Corporate silos and fiefdoms (remember, the customers are in charge of the kingdom) need a strategic group or individual to bridge the gap and broker the convergence. This person is a Smarketing Director. Although I’ve not seen this official ‘Smarketing Director’ moniker, it is present in evolving smarketing organizations. They are the ones taking the leadership role by laying the foundation. They are bridging the gap between sales and marketing. Most start with a single project, like social selling awareness program or provide structured LinkedIn tune-ups to the sales and marketing departments. 3. A Sales, Marketing or Smarketing Playbook Drives Quicker Adoption. Sometimes the quickest way to drive adoption is to bake the ingredients into an established recipe, to make it new and improved! The fastest way to drive smarketing adoption is to co-opt native behavior and not to ask someone to do something completely different. Just integrate it into a smarketing play. Smarketing 1 by Kenny Madden Are You Smarketing or Smelling? 6. Content Marketing Strategy Is Key To Being A Smarketer. Marcy Hoffman, a Miam-based Independent Consultant who helps start-ups and small businesses who people start the process by looking for information often because they know their problem, but haven’t defined the solution; adding Knowledge/content at the beginning of the process helps identify the content creator as a leader in their industry which serves to reinforce the next stage. 7. Adapt and Adopt or Be Overlooked. Victor Clarke, principle for Clarke, Inc, a marketing services firm, states, “I have sold everything from Xerox copiers in the 80s to the first computers to be installed in the US House of Representatives and the US Senate in the 90s to marketing services currently. Sales has been turned upside down in the last 5 years with smarketing. SPIN selling is dead and sales folks either adapt or they are gone.” Mike Ausloos, Head of Business Development for Northern Concrete Construction stated “I don’t know how any system can be effective without operating with SMARKETING. Both are gathering market info & there needs to be collaboration to form the correct content, selling points, etc. seems to be missing a determiner before it.”Barbara Giamonco states in her book, The New Handshake: Sales Meets Social Media, “In the midst of this communication revolution sales must adopt a new approach that incorporates social media. When we overturn the old business practices, what emerges is something called “smarketing.” Sales and Marketing need to work in tandem, as Giamonco notes. However, some forced ‘hard wiring’ likely needs to happen for evolution to effectively occur. Do you have a smarketing guiding principle or point to share? If so, please comment below. Or reach out to me directly at MarketingThink.com, LinkedIn, Twitter or Google+. 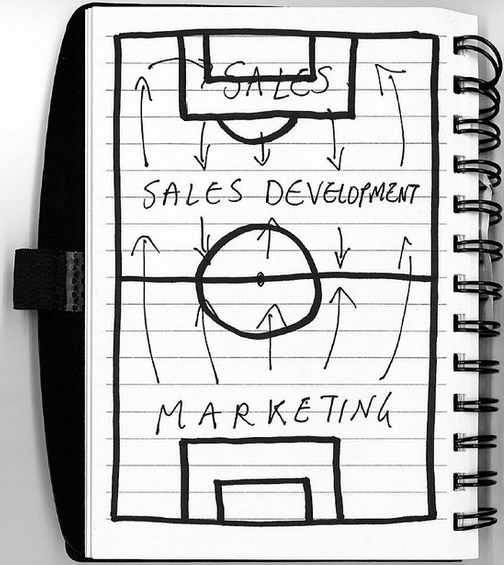 Combining sales and marketing to achieve company goals is key. If you do it right, then you are a smarketer. If you don’t do it right then you are a smeller. Which one are you? A smarketer, or a smeller?